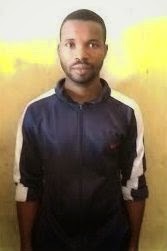 A member of the Nigeria Security and Civil Defence Corps (NSCDC), Assistant-Inspector Lasisi Kabir Iyanda, has been arrested and detained in Police custody over the brutal murder, on 27 June, 2014, of a 32-year-old Kamaldeen Muritala, an Islamic Religious Knowledge teacher attached to Titilope Islamic Comprehensive High School, Ejigbo, Osun State. Following the demise of the deceased Islamic teacher, students of the school attempted to raze down office structures belonging to the NSCDC as well as those of other government establishments in the area, but the timely intervention of the Police prevented further breakdown of law and order. Meanwhile, the Police High Command has commended the officers and men of Osun State Police Command for their timely intervention which helped to rescue the 30-year-old suspect concerned as well as other property and whittle down what otherwise might have turned into a major catastrophe. The apex Police Authority however, enjoins citizens never to take laws into their own hands no matter the provocation, promising that justice would be served in this case. President Umaru Musa Yarâ€˜Aduaâ€˜s insistence on fiscal federalism and alleged contract inflation may have spelt the doom for Nigeriaâ€˜s $8.5billion (N1.2trillion) rail modernisation project agreement with the Chinese, investigations by SP have revealed.